Revolutionary Guards say silo will allow them to launch the country's long-range ballistic missiles. Iran's Revolutionary Guards unveiled an "underground missile silo" Monday which they said will allow them to launch long-range ballistic missiles, state television reported. According to AFP, the broadcast showed footage of a facility at an unknown location, with an underground missile silo holding a projectile described as a Shahab-3 missile. The state television website quoted Col. Asghar Ghelich-Khani, the exercise’s spokesman, as saying that "The technology to build these silos is completely indigenous." State television also showed a missile being launched, but did not give details on the missile type or the timing of the launch. Shahab-3 is a liquid-fuelled missile with a range of nearly 2,000 km. and can reach all of Israel as well as U.S. bases in the Middle East. 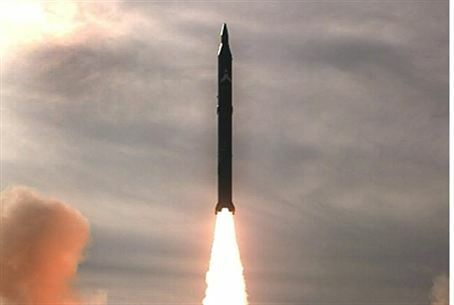 AFP noted that in recent years, Iran has tested a dozen of these missiles, which are believed to have been derived from the North Korean No-Dong missile. The unveiling accompanied a military exercise codenamed Great Prophet-6, which was to include the launching of various ballistic missiles.